Vanessa: We at For Foods Sake are lovers of both wine and cheese. When the opportunity arose to road test the ‘Fromage to You’ degustation at Abode Bistro Bar , needless to say the excitement levels were high. 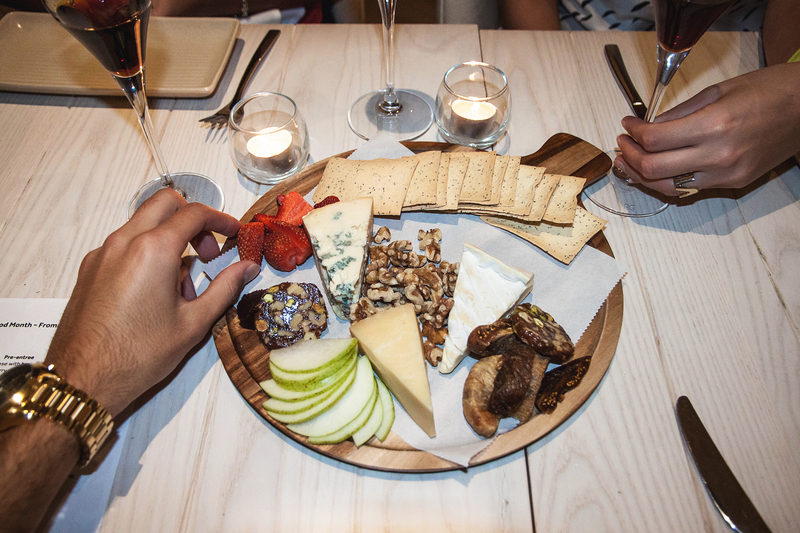 Abode has created a bespoke cheese and wine degustation for the Good Food Month throughout October (although we are hoping this will become a permanent fixture on the menu so that we can have it again!). Abode Bistro Bar is adjacent to the Park Royal Hotel in Sydney’s CBD. It’s worth noting that the decor and ambience of the bistro is far from what you may expect of a hotel establishment. 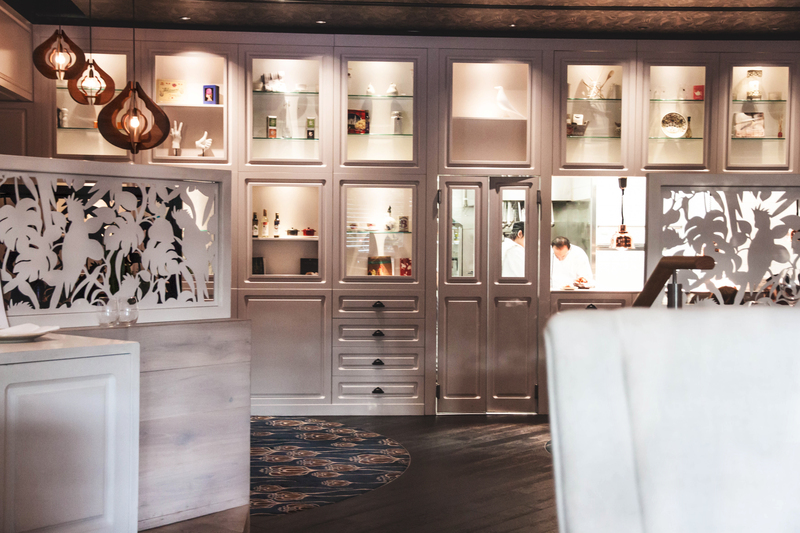 The white furnishings and dim lighting creates a modern, Parisian ambience that is the perfect setting to settle in and enjoy a variety of cheese courses with matched wines. 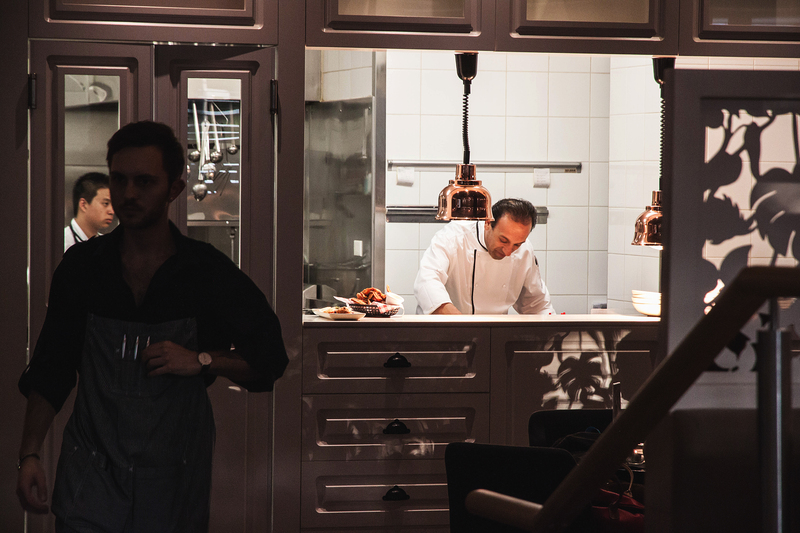 The bistro features a semi open kitchen where you can catch glimpses of the team of chef’s busily preparing meals as well as two bars, one located in the bistro and one as you enter. The ‘Fromage to You’ menu created for the Good Food Month, is a 4-course degustation for $99. We thought this was incredibly good value for the quality of the dishes and quantity of the matched wines. The pre-entree was a delightfully light dish of Jannel buche blanc goats cheese with braised leeks, candied walnuts and sherry vinaigrette. The cheese was very subtle which complimented the sweetness of the walnuts perfectly. The candied walnuts also adds a sharp textural element to the creaminess of the goats cheese. This was paired with a crisp, generous serve of Yalumba Y Series Pinot Grigio. The entrée was a crab & Gruyère souffle with Le Superbe Gruyère Swiss and carmelised onion puree. Gruyère just happens to be one of my all time favorite cheeses so needless to say I was thrilled it was incorporated into the degustation. The souffle was like a soft, pillow of cheese with a sightly crispy exterior that was complimented well by the sweetness of the caramelised onion. The muted fish tones from the crab added a subtle flavour to the souffle and was well matched with Yalumba Y Series Savignon Blanc. We were delighted to see the substantial size of the main as it was set down in front of us. A parmesan and herb crusted veal rack with 18 month aged Grana Padana, endive and apple salad with a tomato relish. This was a stand out for us as the veal was cooked to a perfect medium rare and extremely soft. The bold flavours of the parmesan crust left sharp tones on the palate but was well-balanced with the freshness of the endive and apple salad. Our only comment was that a carbohydrate would have been welcomed with this dish. It was well paired with a glass of the bold Yalumba Traditional Galway Shiraz. The fourth and final course was the one we were perhaps most excited about – the cheese board. The board consists of three different types of cheese. A Will Stud Le Dauphin Brie (France), an Oaks Smoked Cheddar (England) and a Milawa Blue (North East Victoria) complimented with fresh figs, strawberries, apples and quince. I judge a good cheese board not only by the quality of the cheese but also by the quantity of the accompanying crackers, as i’ve experienced anxiety in the past over cracker rationing! I’m pleased to say that the “cracker-to-cheese ratio” was just right and we were all able to enjoy adequate portions of both. The stand out cheese was the Milawa blue as it was quite subtle for a blue and has a very creamy texture. The least favoured was the smoked cheddar as it left a slightly odd aftertaste that didn’t sit well. The cheese board is matched with a sweet Yalumba Muscat that works very well indeed. Hats off to Abode Bistro Bar for creating such a delicious cheese degustation at great value. Definitely one for all lovers of cheese and wine to try..but be quick as the ‘Fromage to You’ is only available as part of Good Food Month until the end of October. Special shout out to our waiter, Adrian, for his attentive and friendly service throughout the evening! *ForFoodsSake were invited to dine as guests of Abode Bistro Bar, all opinions however are our own. Oh heavens does that cheese plate look amazing! Thanks for sharing! so stunning – I am 80 per cent cheese and this menu is calling my name. Then it’s definitely one for you to try! We loved it! So much cheese. Always a fan of Will Studd cheeses too .